The Financial Supervision Commission has approved a minimum yield of 0.25 % on an annual basis, resulting from the management of the Universal Pension Funds /UPF/’ assets for the preceding 24-month period, considered from 31 March 2011 till 29 March 2013, while for the same period of time the minimum yield for the Professional Pension Funds /PPF/ has been determined at 0.57 % on an annual basis. The weighted average yield (modified weighted yield ) of UPF for the same period, calculated on an annual basis, is 3.25 % and for PPF 3.57 % respectively. BASPSC representatives will take part in the IOPS/Pensions Europe Seminar “Pension Developments in the CEE Region”, which will be held on March 1, 2013 in Bucharest, Romania. The Financial Supervision Commission has approved a minimum yield of 0.40 % on an annual basis, resulting from the management of the Universal Pension Funds /UPF/’ assets for the preceding 24-month period, considered from 30 December 2010 till 28 December 2012, while for the same period of time the minimum yield for the Professional Pension Funds /PPF/ has been determined at 0.66 % on an annual basis. The weighted average yield (modified weighted yield ) of UPF for the same period, calculated on an annual basis, is 3.40 % and for PPF 3.66 % respectively. The Execurive director of "Allianz Bulgaria" at "Capital Daily". In view of the doubts and comments that have been appearing in the Bulgarian press, implying that the Chilean system has been a failure, I want to highlight certain studies carried out by specialists on the subject. These confirm the good performance of the Chilean individually-funded system, reformed in the year 1980, which has now been in force for 32 years. I also want to send you figures with the results produced by that system. The topic selected for the Round Table is extremely relevant in light of the pressing need to discuss and find legislative solutions and practical approaches to the regulation and implementation of the payout period in the funded mandatory and voluntary pension schemes. Benefit payments are directly relevant not only to the continuous discussion about the country’s social security system, but also to the attempts for finding alternative solutions to offset the impact of certain wrong and inefficient political, economic, financial and social decisions for the transformation of the three-pillar pension model introduced in the country, which model has otherwise been assessed as quite successful by the International Financial Institutions and retirement provision organizations. The round table discussed also the efficiency of the pension funds investments and their contribution to solving the most pressing economic and social issues in the Bulgarian society. 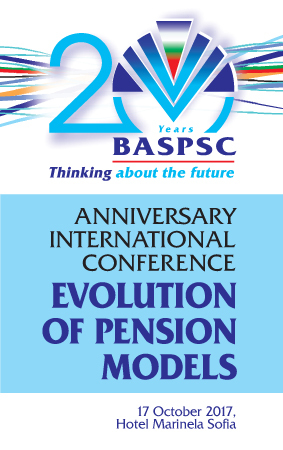 On the occasion of the 15th anniversary of BASPSC, it worth noting that ever since its establishment, the Association has represented all pension companies providing supplementary mandatory and voluntary pensions and throughout these years it has been an active player in the drafting of the new retirement provision legislation, in the development and implementation of the established pension model. As a result of these endeavours, we are proud to report that through September 30, 2012, the supplementary pension funds in the country covered a total of 4.065 million members, and the net assets under management in these funds, i.e. the total accumulations in the members’ accounts exceeded BGN 5.426 billion. It is important to note that the big bulk of these financial resources have been invested in the Bulgarian economy, and this is vital for our country not only in the current conditions of an economic crisis, but also for its future development. In addition, in the period between 01.01.2002 and 30.09.2012 the pension funds have paid out to members and their survivors more than BGN 580 million. 20 November 2012 - The EFRP today launched its new name at the European Pension Funds Congress (EPFC) in Frankfurt. Ms Joanne Segars, EFRP Chair, presented the new name and logo during her opening speech, stating that the new name will make it much easier to understand what the Federation represents. The new website will be set up shortly. 12 November 2012 - The EFRP today elected Ms Joanne Segars, Chief Executive of the National Association of Pension Funds (NAPF), as Chair. She will still remain as Chief Executive at the NAPF. Mr Pierre BOLLON and Mr Benne van POPTA have been elected Vice-chairs. Presentations of the European Pension Funds Congress /click here/. The Financial Supervision Commission has approved a minimum yield of 0.43 % on an annual basis, resulting from the management of the Universal Pension Funds /UPF/’ assets for the preceding 24-month period, considered from 30 September 2010 till 29 September 2012, while for the same period of time the minimum yield for the Professional Pension Funds /PPF/ has been determined at 0.74 % on an annual basis. The weighted average yield (modified weighted yield ) of UPF for the same period, calculated on an annual basis, is 3.43% and for PPF 3.74% respectively.